My grandmother lived at the beach, but not on the beach. Her house and the apartments she offered for weekly, monthly and seasonal rental were a block east of Ocean City, Maryland’s Sinepuxent Bay– but we kids preferred to use the name for the adjacent bay just to the north: Assawoman. A few blocks to the south is an inlet, cut by the Great Storm of 1933. Standing at that inlet, you look across to Assateague Island, famous for its wild ponies. I spent the first eleven summers of my life sleeping in a large bedroom at the back of my grandmother’s house. I shared the bedroom with my older sister and our cousin, but because I was much younger, I was often in my bed hours before them. Even at the height of an Eastern Shore summer, the window air conditioner could sometimes be turned off and the evening would slip into our bedroom through three casement windows. Lonely for my sister and cousin and restless from sunburned skin sticking to warm cotton sheets, I would lie there and listen to the steady hum from the cars crossing the Harry W. Kelley Memorial Bridge just beyond my grandmother’s property. The Kelley, or Rt. 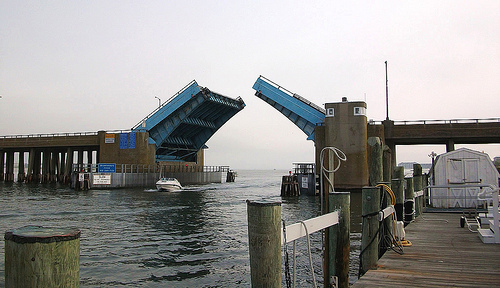 50, Bridge, connecting the southern end of the barrier island on which Ocean City is built to the Delmarva Peninsula, was a drawbridge. But it spent most of its time as a bridge. Cars, trucks, and heavy equipment crossed at a pace that created a steady hum and abrupt thump thump as each vehicle crossed the grids and heavy metal plates that made up the bridge deck. The reassuring hum of all those tires approaching or leaving the island for fun or for work was my nightly lullaby even after I passed the age of bedtime songs. Occasionally, the steady hum would cease when a sailboat or a cruiser, too tall on the waterway, needed to pass by. Then the hum would stop for the ding ding ding-ing bell that indicated the bridge was drawing up. If the waiting boat was a motor boat, the engine idle would increase, and I would listen to hear if the boat was traveling further north into the bay or south toward the inlet and the Atlantic Ocean. But if the bell meant the bridge was drawing up for a tall-masted sailboat, the night would become very quiet; no humming tires or rattling metal grids, no motor sounds urging a powerboat to clear the span so the traffic could continue on its way. Just night sounds– crickets, a screen door brushing open and slamming shut, the soft laughter of a sister and cousins old enough to still be up. Finally the bridge master would determine that the boat had cleared the bridge and the span could be safely lowered. The hum of tires and expectations would resume. 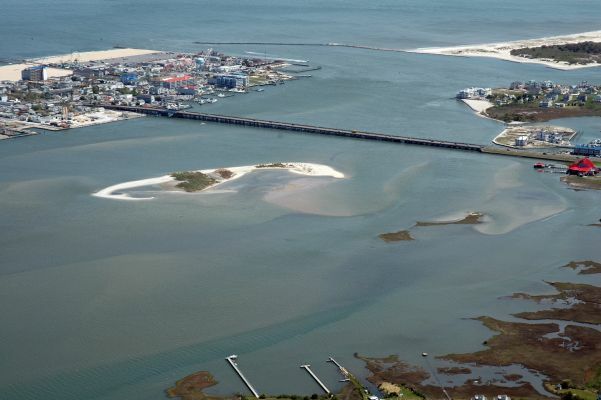 I’m pretty certain the Harry W. Kelley Memorial Bridge still connects the southern end of Ocean City to the Delmarva Peninsula. I could Google it, but facts and memories are often as compatible as dysfunctional kin. I do know my grandmother’s house and the apartments she rented are gone, lost to development and also to the harsh realities of salt air on wooden structures. Lying there as a young girl alone in the semi-darkness, listening to the hum, I longed to be old enough to stay up with everyone else. As an older woman, I long to be that young girl, alone, and listening again. There is still time for them to pick this one! I would!